Lighting in your home is one of those items that you don’t always notice when it has a good presence and feeling when you’re in the space. Although, when the lighting is poor and you are trying to perform a task, or you feel the opposite of how you would like to feel in the space, you notice it immediately. Lighting is for ambiance, aesthetics, tasks, and seeing better in your home. Think about your home and if it has all the lighting qualities you would like. If your answer is no, here are some tips on how to choose the perfect lighting for you and your family. Determine what your lighting goals are: Direct or task lighting is focused in the space you are trying to work. Ambient or indirect lighting is used for ambiance and for overall lighting of a space. Once chosen you can begin to choose lighting options. Each room in your home should have a mood you want to set, as well as a function you want your lighting to serve. Provide lighting for safety and security on the exterior of your home: Walkways, sidewalks, perimeter of your house, and the front entry should be lit with ambient lighting. Too dim of lighting on the exterior is a welcome sign for intruders. While too bright of exterior lighting is costly and disturbing to neighbors. Consider installing flood lights at the exterior corners of your home that are motion activated to further deter intruders. Follow the aesthetics and security lighting of your neighborhood for further guidelines as to what to implement at your own home. Use exterior wall sconces for décor: Outdoor lighting doesn’t have to only be utilitarian. Wall sconces can provide washes of light against the exterior walls of your home to create ambiance in the evening hours. Directional sconces pointing upwards or downwards can focus on architectural elements on your home, and draw attention to exterior niches and plantings around your home. Inside your home use multiple light sources for one space: For rooms like the kitchen, bedrooms, and living spaces, multiple light sources will help you achieve a variety of functions and activities in that space. 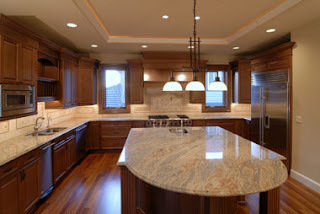 In the kitchen, under counter lights can provide great task lighting. While in a living room, opt for a floor lamp next to a couch or favorite reading chair. In bathrooms the lighting at the mirror should be free from shadows and glaring light. For high ceilings and modern décor use recessed lighting: “Can” light fixtures, so called because of the metal recessed “can” that is inserted into the ceiling and the light fixture fits inside. These fixtures are subtle and can be directional, and can be connected to dimmer switches to give a range of light from subtly dim to full brightness to illuminate an entire room. In nurseries and kid’s rooms, remember night lighting: Think about the lighting for when children sleep when planning lighting requirements. Night lights can help small children from being scared, but can also help parents navigate through dark rooms. For nurseries consider a dim wall sconce, or table lamp that can be used for changing diapers, or rocking infants to sleep. In formal living and dining areas, research chandeliers wisely: In spaces that a formal chandelier is considered, choose one that will not date your space. Often time’s chandeliers are bought without thinking of the space and the décor that surrounds it. Chandeliers come in extremely simple designs that include faux candles, small bulbs, or a few lights to the ornate and expensive crystal varieties. Whichever is your décor choice, measure out the space, and ceiling height before ordering to ensure enough head room will be available below the hanging chandelier. Don’t be afraid when choosing lighting for your home, it can help your ambiance and mood in the space. If you need lighting help ideas get inspiration from lighting stores, catalogs, and online decor and fashion blogs/magazines. Just like the color of your rooms, lighting should enhance your space and make it feel warm and inviting!